Convenience and comfort dictate people's email marketing platform of choice. Let's face it – nobody wants a free product that's buggy and unpolished. In fact, people are willing to pay premium prices for a product that fits their needs and wants. Of course, the price should align with the features of the email marketing platform for them to consider spending cash on it. In my past reviews, MailChimp trumps over tools like Emma because it provides businesses with a platform to build an email list from the ground up without shouldering any costs. Its cost (or lack thereof) goes on top of MailChimp's features (drag and drop builder, landing page builder, social media ad campaigns, etc.) that make it an ideal choice for startups and small businesses. However, it shouldn't discount the fact that other email marketing tools like Emma above as well as Sendinblue offer something of equal value to its audience. It may not be evident because they are overshadowed by MailChimp's pricing and features. But I can easily imagine some business owners using either Emma and Sendinblue instead of MailChimp for all their email marketing needs. My point is that it doesn't matter if MailChimp is free and is one of the most popular email services in the market. The choice of email marketing software all boils down to personal preference. It is because of this reason that makes this Mailerlite vs ConvertKit Review interesting. You can try MailerLite for FREE right here. On the one hand, you have an email marketing tool that is free up until you reach over 1,000 subscribers and is polished enough to offer marketing automation features, embeddable forms on your site, and more. On the other, this email service provider charges you from the get-go and offers almost the same features. From the description, you'd be inclined to choose the former than the latter especially if you don't have a list yet. If there's an option to not pay for an email marketing tool that offers premium features, then it's difficult to find a reason why you shouldn't take that offer. However, an as mentioned above, it's all about the convenience and comfort that both tools provide to people. The question now is that which between the two will give you the most satisfaction and comfort to implement an email marketing strategy for your business? 1.4 Mailerlite vs ConvertKit: Which one is right for you? Mailerlite has been around since 2005 as has slowly been building a reputation as one of the most cost-effective email marketing tools around. Founded in 2015, ConvertKit has made the same amount of splash in a shorter amount of time thanks to their impressive array of email services that benefit their target audience. Both are equally good email marketing platforms so you really can't go wrong with either. But as I've said earlier, it's not about choosing what is considered the best by the consensus. In fact, there is no right answer in this regard. Your choice for email marketing software depends on what you think is convenient for you. Some people may find Mailerlite easy to use and ConvertKit complicated and vice versa. To understand which of the two you should go with, let's delver into the unique features that each tool boasts starting with Mailerlite. Don't let the name put you off. Mailerlite is far from being a “lightweight” tool for your email marketing needs. However, it is light for a different reason which I will explain later. Other than that, the software offers everything you need to build an email list of your rabid followers and sending them engaging emails that range from trigger-based campaigns to one-and-done broadcasts. There is no way around it – Mailerlite is arguably the most affordable email marketing tool out there. Your first 1,000 subscribers are on them. Until you've exceeded over a thousand subscribers, you don't have to pay a cent. Better yet, you have access to all of its features. Unlike other tools that restrict you from specific features, Mailerlite lets you use the form builder, landing page builder, automation rules, A/B testing, and more to help you build a list much easier! Once you eclipse 1,000 subscribers, you will have to pony up $10/month until you reach 2,500 subscribers. For 2,501-5,000 subscribers, you will only have to shell out $20. 5,001-10,000 subscribers only cost $35. Lastly, 10,001-15,000 subscribers amount to $50/month. You can make the case that MailChimp is cheaper because it remains free until you reach 2,000 subscribers. However, what MailChimp doesn't tell you is the price you have to pay once you exceed 2,000 subscribers. If you have between 2,001-5,000 subscribers, you will have to pay $50/month, which is equivalent to 10,000-15,000 subscribers in Mailerlite! The cost balloons as your MailChimp list grows which could put your finances at risk. Therefore, if you're looking for a cost-efficient email service provider that doesn't hold back on its features, then Mailerlite is something that you need to consider seriously. Try MailerList for FREE right here! Sometimes, it is not enough to send emails composed primarily of text to your subscribers. As visual animals, people process information from pictures faster than they do in text. Therefore, you want to send visual emails that are not only attention-grabbing but also help communicate your ideas better and more conveniently than text ever could. Mailerlite's drag and drop builder makes it possible for businesses to send emails that are attractive enough to their subscribers without compromising its message. In fact, Mailerlite is perfect even for those without any design experience. When creating emails using the platform, you can drag and drop element onto your email like you're a professional designer. In some ways, it is similar to Thrive Architect because you don't have to write a line of code to achieve the look you want for your emails. Let's say you're not comfortable with your design choices. 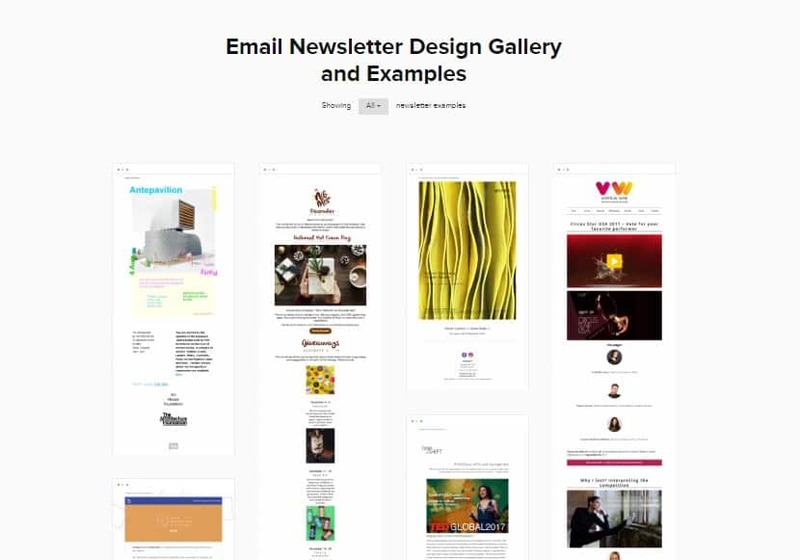 Mailerlite lets you choose from a variety of newsletter templates that you can edit and tweak as you see fit. You can also use the templates to help you create your custom design without having to start from the ground up. If your business is dependent on tradeshows and setting up shops in expos, then Mailerlite is perfect for you. The idea of setting up a booth in these types of events is to attract your audience to see your products and get to know more about your company. At the same time, you want to keep in touch with them and not just let them slip from your fingers after browsing through the wares in your booth. One way to do this is to ask them to leave their name and email so you can add them to your mailing list. There are lots of tools out there that let you capture their name and email address offline, but only a handful of email marketing tools can do this. Mailerlite is one of them. Using the Subscribe App on iOs, you can use your iPad to collect the email address of people who passed by your booth and want to learn more about your services. You can collect their information even when there's no internet connection nearby. The app will upload all details immediately after you go online. Also, setting up the sign-up page on iPad only takes a couple of seconds. Unlike Mailerlite that is geared towards small businesses, ConvertKit appeals to bloggers and content creators. As opposed to small business owners, bloggers have a different set of needs and wants for their email marketing tool. ConvertKit happens to offer features that bloggers and freelancers will love. I have made a previous argument that people are visual animals and prefer to consume visual content compared to written ones. While there's truth to this statement, it doesn't apply to the general public. In fact, a lot of people prefer receiving emails that are text-based because it feels more organic and natural as if you're talking to a friend. Newsletters that are chock-full of colors and graphics feel like it's created by the brand's marketing team. If you go overboard with your newsletters, you risk losing the personal element of your emails. ConvertKit simplifies the process by sending only text-based emails. You won't be able to create visual emails to your subscribers. However, if you want to come off as a helpful friend to your subscribers instead of a polished, corporate brand, then text-based is the way to go. Again, limited options to the type of emails you can send help to eliminate analysis paralysis so you can focus on crafting the best email you can send to your subscribers. One of the best ways to build your email list is to incentivize subscribers. “Receive my newsletter” and “Sign up to my weekly emails” are no longer enough to grow your list. Even if you do send out quality emails time in and out, you still need to go out of your way to offer something of added value to your audience. This is where content upgrades come in. Similar to a “tripwire,” content upgrades help tip the scales to fully convince your blog visitors to sign up and become a subscriber. Content upgrades come in the form of e-books, whitepapers, webinars, and others. For example, if you wrote a post about how to start a blog, you can offer a free e-book about the different ways on how you can monetize your blog. Since the post is about starting a blog, the e-book complements the information of the post and therefore is an appropriate content upgrade. However, to get their hands on the e-book, they need to sign up to your form and become a subscriber. 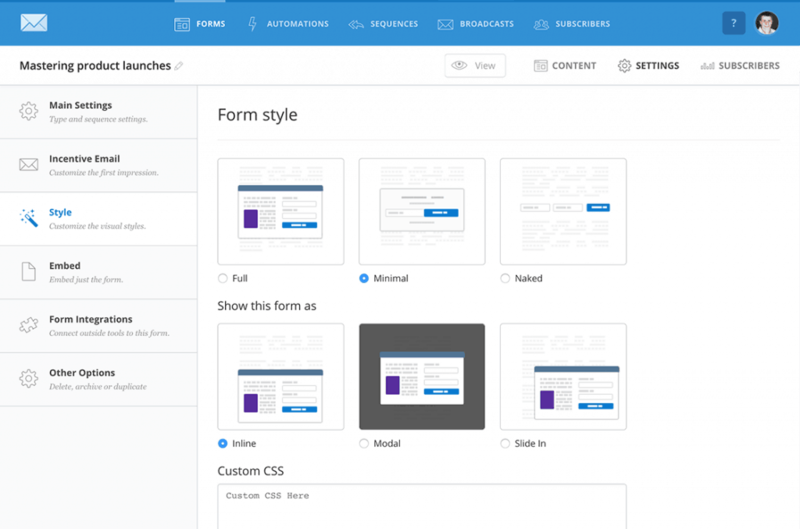 ConvertKit allows people to incentivize the optin forms by attaching the content upgrade to the form. Once people sign up to that form, the file will then be available for download. While Mailerlite has automation capabilities, ConvertKit offers more advanced features to help you organize your list. 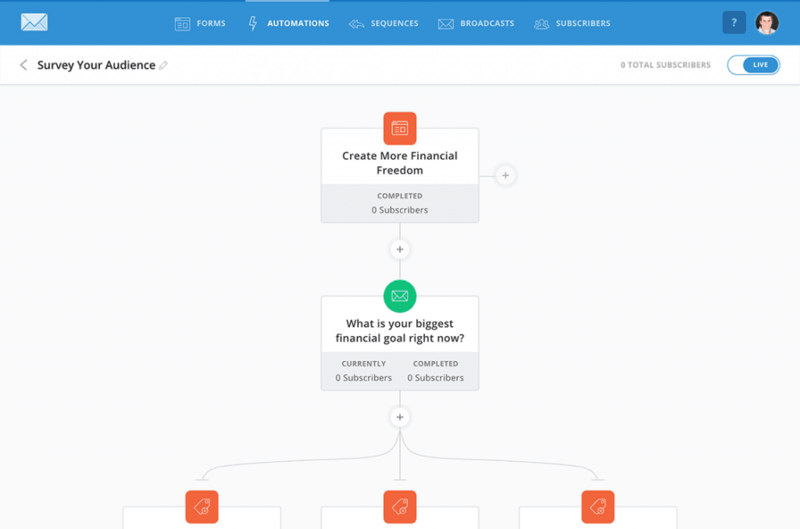 One of the best features of ConvertKit's automation features is the ability to take each step of subscribers according to different parameters. Choose from Event, Action, and Condition to help you send targeted emails to your subscribers. For instance, if you want to send an email to subscribers depending on which action they need, click on Condition to identify which tag or custom field which receive which email in your automation workflow. Also, if you want to jump to a part in your workflow, you must choose Event and determine the trigger that the workflow will observe (tag is removed or added, date occurred). Email marketing tools are a complicated bunch. A lot of them are excellent and offer more than enough value to justify your intention of choosing them. Given the unique features of both tools, you can quickly make a case for Mailerlite or ConvertKit depending on the priorities of your business. At the same time, none of the best email marketing platforms are flawless. What seemed to be the best email marketing software ever apparently has dents and scratches that didn't manifest until you started using it. That goes the same for Mailerlite and ConvertKit. As good as both tools are, they are not for everybody. Therefore, you can't just blindly sign up for a paid subscription for either platform without reading reviews like this one. It is my job to help you invest in the right email tool for your business. Without further ado, below are the pros and cons of each tool that you need to consider before making a decision. Affordable – There's no doubt in anyone's mind that Mailerlite will come up on top of a lot of people's list because of is cost-efficient pricing. It doesn't offer a free plan for up to 2,000 subscribers like MailChimp, Mailerlite is much cheaper than MailChimp – or any of its competitors – in the long run. Lots of customizable features – If you want to impose your branding on all the emails you send, then Mailerlite fits the bill as your email service of choice. You can customize all available the newsletter templates to include your logo and color scheme. Using its Unsubscribe page option, you can edit the message before they choose to unsubscribe from your mailing list in the hopes of getting back to their good graces. Lastly, you can add a personal touch to all your emails by uploading a picture of yourself to help you create images that you can use on all your emails. Too many options – There is such a thing as too many choices as it prevents you from making the right selections. Unless you are inundated with the best practices of email marketing, then you may fall prey to the pitfalls of bad emails using Mailerlite. For example, there's a chance you may be adding more than enough images in your newsletters which could result in all your emails going to the spam folder of recipients. Non-transparent approval system – Unlike other email platforms that you can sign up for free or on a trial period, Mailerlite requires you to follow a step-by-step instruction for the system to approve your account. You need to fill out all the details of your account including your site, email using your website domain, and other information. The problem is that you don't have a guide that will tell which steps to take next to complete the process. You're left on your own to figure out how to complete your process and send it for approval. To make matters worse, their system won't say why your account is rejected (if it comes to that point). You made all the effort to fill out your profile only to be dismissed in the end without rhyme or reason. Simple and straightforward – ConvertKit subscribes to the idea that less is indeed more. While ConvertKit offers limited features compared to more prominent platforms out there, the things it can do rivals that of the best email marketing tools out there. As a result, the tool is very easy to use and intuitive even for people without any experience in email marketing. ConvertKit makes creating autoresponders fun and interesting instead of overbearing. Subscriber-based system – Unlike other tools that implement the list-based system, ConvertKit lets you organize all your subscribers using tags. They are not segregated according to lists which makes emailing them much more comfortable – you don't have to launch the same campaigns for every list. All you need to do is enter the tags of subscribers whom you want to receive your emails, and you can do that with just one action. Relatively expensive – If you're running low on funds and want to build on an email marketing tool, then ConvertKit doesn't present itself as a good choice. The most affordable subscription level ($29/month) may be too high for some especially for those who don't have a single subscriber yet. ConvertKit may not as expensive compared to other email marketing tools, but Mailerlite proves to be more affordable in this case. Also, considering how simple the platform is, it is surprising how much they are initially charging for their paid subscriptions. Too simple – There's also a case of not having enough features to justify the costs. As mentioned, the things that ConvertKit does are some of the best in the email marketing industry. However, some bloggers and content creators may want more juice and flexibility from their email platform to help them reach their audience more effectively. 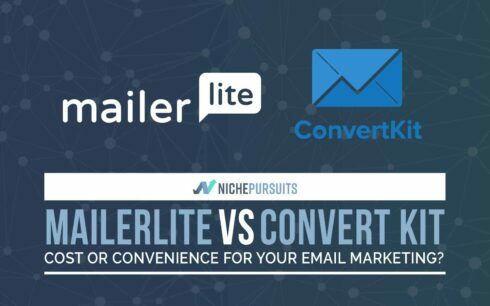 Mailerlite vs ConvertKit: Which one is right for you? Judging from the review, both tools work under different philosophies for their approach in email marketing. 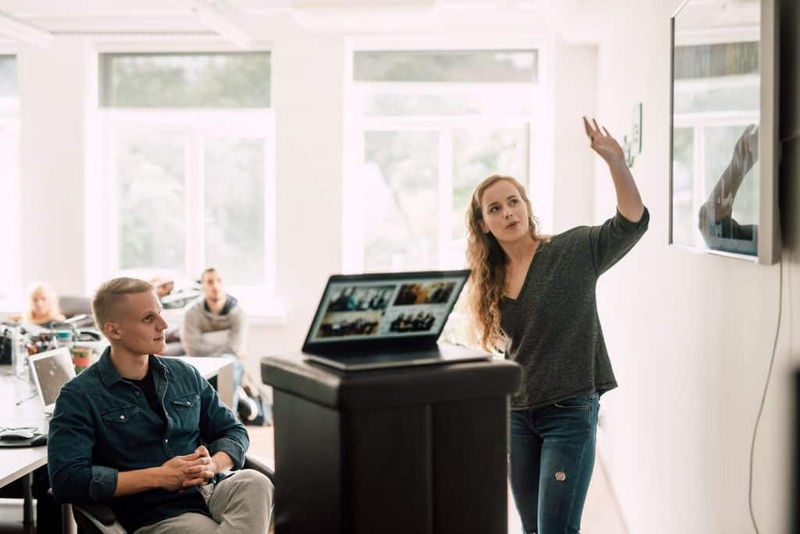 Mailerlite provides the most features and options to help small businesses come up with the best ways on how to build and engage with their subscribers. The drag-and-drop builder is a huge advantage for people who want to spruce up their emails and launch attention-grabbing campaigns that leave a mark on their audience. On the opposite side, ConvertKit focuses on providing bloggers a platform to present their ideas in a clear manner without the bells and whistles that are ultimately unnecessary in the long run. However, pricing could be a big factor here. If you don't have the cash to pony up for your email marketing tool, then Mailerlite proves to be your prime choice thanks to its free plan. However, don't cross out ConvertKit just yet – you have to get your Mailerlite account approved first before you can use all of its features. Until then, you have to be cautiously optimistic with Mailerlite as your initial choice. If simplicity is your thing, then ConvertKit offers the most essential and important feature to help you grow your list and send messages that matter to your audience. Its powerful marketing automation features will keep you busy until you find the best combination of autoresponder to keep your subscribers engaged and your list healthy. Considering that the tool costs way more than Mailerlite, I'm sure that people will be more than willing to spend for ConvertKit so they can enjoy all of its features. How about you – do you have any experience with using both tools? Which one do you prefer? Share your thoughts by commenting below!